Do you want to get a good steak for your dinner? Then you should try Omaha steak. Omaha steak is one of the most anticipated steaks for every meat-lovers. It has stood on top of meat market since 1917. This steak is very flavorful and fantastic; you can make it steak or make a burger. Many markets have sold Omaha steaks far before we know it. The reason why it still stands and keeps the business is probably because of its quality and big names. However for some reason, with the development of technology, Omaha Steaks have started to fall off from its prime quality. Not much to say, but it is quite disappointed for its fans as it seems that the new generation is pretty much ruined the Omaha steak. So if you want to know more about Omaha Steak, let’s see more below. Omaha steaks are well-known steaks which are sold in the frozen state. Many customers love its taste because Omaha is really about a tasty meat which takes place as traditional steaks. Omaha still defends its classic looks. However, in recent years, many customers start to complain how Omaha Steaks are not worth its price and how it has fallen off from its quality. The company itself looks like doesn’t know about the real problem. The enterprise and advertisement are what the company emphasized, but instead, the quality of the meat is their real problem. The most important thing from meat or steak is about its taste. We expect a wild and flavorful meat which has an easy setup. In this case, Omaha steak has a pretty easy setup and cooking process. Omaha steak comes in frozen shape, even though it is frozen, but the beef is quite flavorful, and the delicious fat is still there. The beef is very juicy, and it is tender after we cook it. The downside is probably coming from its fat. The amount of fat that Omaha steak exceeds is just too much. With the evolving era, the modern food is usually not only marks from its taste, but also from its healthy factor. Burger or steak is not that healthy, but Omaha steak is just bringing the new level of unhealthy food. That’s maybe the reason why many of its customers are complaining about Omaha steak. You also will get a problem when grilling Omaha steak as it is not suitable to cook it with griller. The steak is very fatty, and you can just swim in grease when the steak is cooked. Omaha steak is a bad meat, but there are a lot of better meats out there which make Omaha looks bad. However, the taste is all that matters, whereas if you love a favorable and fatty meat, then you can choose Omaha, but if you prefer a healthier meat, then you probably need to avoid Omaha steaks. Beef; Boneless and Skinless Chicken Breast, Water, Seasonings (Salt, Rice Starch, Stabilizer Tapioca, Carrageenan), Red Bell Peppers, Extractive of Paprika, Paprika, Onion, Garlic, Spices, Dextrose, Sugar, Orange Peel, Citric Acid, Less than 2% Silicon Dioxide and Soybean Oil; Pork, Nonfat Dry Milk, Corn Syrup, Sodium Lactate, Flavorings, Sodium Diacetate, Sodium Erythorbate, Monosodium Glutamate, Sodium Nitrite. Contains: Milk, Baked Potato, Sour Cream (Cultured Milk with Cream, Nonfat Milk, Locust Bean Gum, Guar Gum, Modified Corn Starch, Carrageenan), Cheddar Cheese (Pasteurized Milk, Salt, Cheese Cultures, Enzymes, Annatto), Butter, Dehydrated Potato, Dairy Blend (Nonfat Dry Milk, Whey, Soy Flour), Bacon (Cured using Water, Sugar, Salt, Sodium Erythorbate, Sodium Phosphate, Sodium Nitrite), Dried Chives. Contains: Milk and Soy. 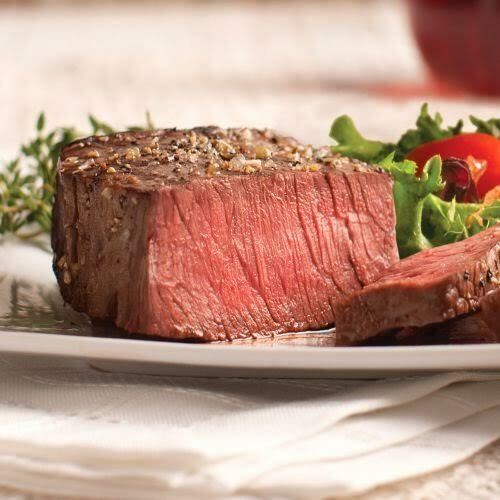 Check the best price for Omaha Steaks here!